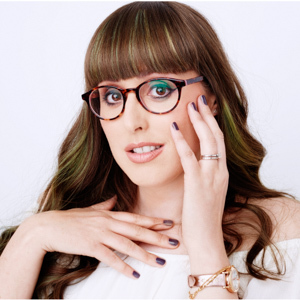 As you know, I have a cute puppy, Falcon, well actually I’m not sure if he is still classed as a puppy as he’s over a year old, and you guys loved my tips on being a puppy owner, so I thought I would continue sharing what I’ve learnt, and trust me this year has been a real learning curve, with a new post dedicated to dog dental care and any excuse really to share more pics of my cutie. Dog dental care was something early on I knew I had to keep an eye on with Falcon, much more so than with the cats, which is why when he was younger we got him used to the idea of a pet toothbrush, we actually made it part of the game we did when we were getting him used to us handling him and clipping his claws and brushing him. 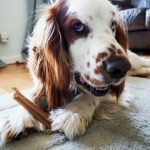 It isn’t easy to brush a dog’s teeth, you will need a lot of patience, but what I would say is keep the sessions short, try and do it daily, even if that’s just him getting to sniff his toothbrush and then make sure you have a treat on hand to tell him how amazing he has been. 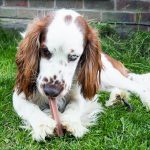 As well as getting a pet toothbrush, Falcon loves his Pedigree Dentastix, which can help reduce tartar build-up by up to 80% when fed daily and can help protect against gum disease. We generally give Falcon one of these most days and while we are eating so he feels like he is eating with us. He’s always super cute eating it as he holds it between his paws like a lolly and really savours every last bit, as once it’s all gone he has to lick the floor around him for crumbs. 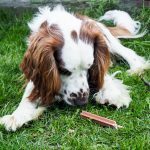 I also find the Dentastix such a great treat when we are out and about and want to eat out as it definitely takes him more than a second to eat his way through one. 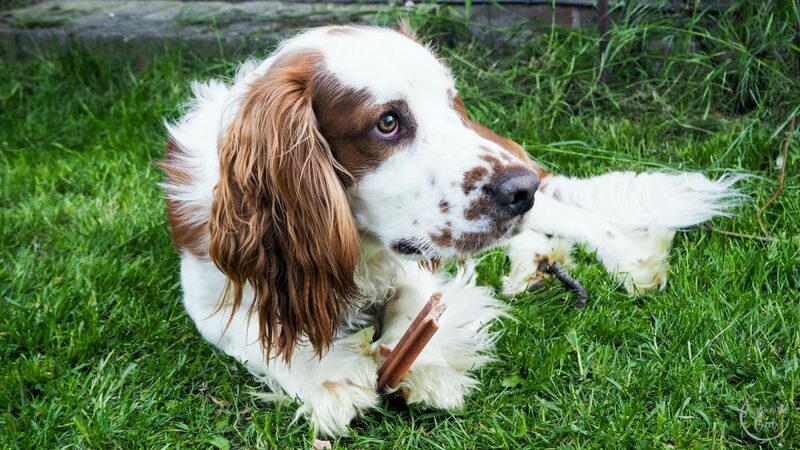 Get a pet toothbrush – this is important, not an adult one but one from the pet store. We tried a few, and one that had a handle didn’t really work with Falcon, instead, we got one that goes on the end of your finger. Much easier to use and he’s less likely to bite it. Use pet toothpaste – again, don’t use your own as human toothpaste isn’t good for dogs because it contains fluoride which is toxic to dogs. Introduce it only when your dog is used to the toothbrush otherwise it could go everywhere. We spent a good couple of weeks just getting him used to the idea of brushing his teeth before we actually used toothpaste. Make dog dental care part of your dog’s daily routine – try and make it the same time and place within the home each day to brush your dog’s teeth. Pick somewhere quiet and without distractions, which is hard as everywhere is distracting for a puppy, but we’ve taken to doing it in the bathroom. Sounds silly but he is always calmer in there. Be patient – Patience is the key, it isn’t a quick process, Falcon needed to get used to the toothpaste, he hated the first one and really you want something you know they would eat, then we had to introduce the toothbrush, then add the two bits together and then actually brush his teeth. I’ve found it is always easier brushing the canine teeth than the molar teeth he is never too keen to do those ones. 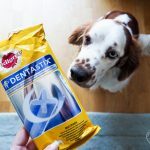 Add a Dentastick – knowing that they help against tartar is important, but more importantly, Falcon loves these dental chews. I would just recommend buying them in bulk as you will go through them, but so worth it as it is such an easy step in his dental care routine. Look at your dog’s teeth – as well as brushing, use this daily clean as an opportunity to look-out for any abnormal signs of dental hygiene such as bad breath, swollen gums, lumps or growths, loose or broken teeth and excessive tartar build up, as anything that leaves you worried you should take your dog to your vet for a check-up. Do you have any dog dental care tips? This post is a collaboration with Pedigree, but all thoughts are my own. For additional dental care information, you can read the following Pedigree Reviews article for tips and advice.